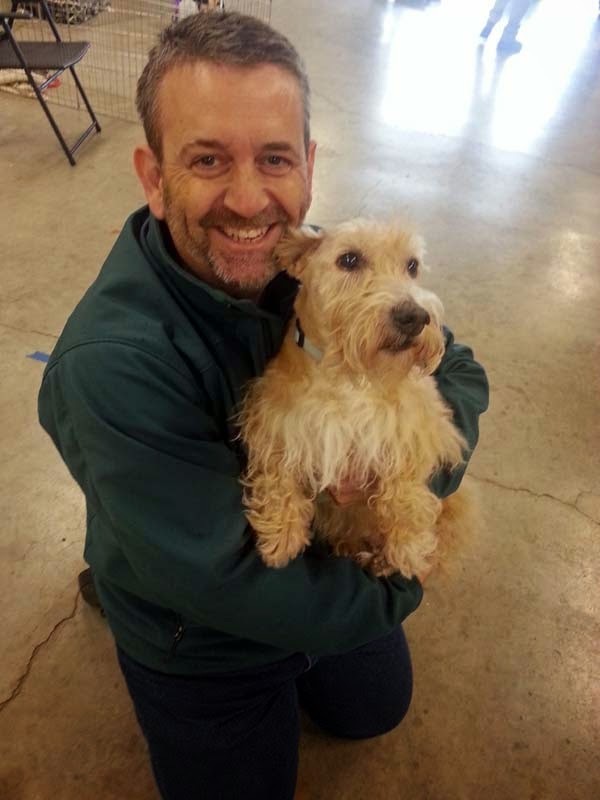 Meet Heather's Foster Scottie Dad John. I've only met him twice personally, but this man (and his whole family) has more of my respect than some of the people I've known for years. Not only did he rescue my sweet Heather Beather and give her a chance to find happiness in our home, he and his family also go above and beyond the call of Scottie duty for countless others. His home is a temporary haven for those in between homes and permanent living quarters for a special few. 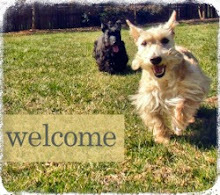 To foster a Scottie is to embrace the chance to give back to the very breed that has and will continue to bring you joy. It is an easy way to put a little good back in the world in a seemingly small way while maximizing the impact on dogs in need everywhere. To foster is to save a life - or two - and to live up to our Scotties' expectations and be the Scottie Mom (or Dad!) our fur kids think we should be. One day, when this Scottie Mom is "all grown up," I hope to be half the person John and his family are for Scotties everywhere. 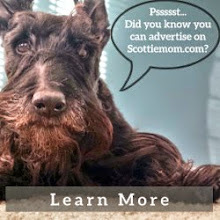 My dream is to be part Scottie Mom, part foster Scottie Mom and to open my home to Scotties in need while preparing potential Scottie Moms (and Dads) to be responsible pet owners. My vision is a world without homeless, abandoned, mistreated, neglected and puppy mill Scotties. John, who has had as many as a dozen Scotties sharing his home at one time, is trailblaizing his way to Scottie sainthood (if he hasn't already achieved that!) and is certainly one we should all be inspired by. ArRRrOo to you! No doubt, there is a special place in heaven for people like John! Fantastic article. And what a fantastic man! As a former secretary of Scottish Terrier Emergency Care Scheme here in the UK I have fostered scotties before finding them forever homes. It is a bittersweet feeling when your foster baby moves on, but you know that you've done more than your best in finding that new home for them ..... and then the photos that come back to you of a happy happy scottie make it all worthwhile. Well done John, ScottieMom and of course the beautiful Heather Beather for all finding each other. Thanks for telling us about John and all the good he does for the Scottie breed. What a wonderful, kind, gentle, understanding and loving man he is! I'll betcha he's the same way with his 2 legged peeps as well because we all know you can't just love a Scottie and not be the same with the hooman race. Hip hip hooray for John! A note for you: please stop making me teary-eyed when I read your blogs (except when they're about Mr.K : then I have to laugh!). You manage to go right to the heart! There aren't too many of us Scots in Arizona. We see a new one once every three or four years. They'd foster one, but there's none to be fostered. I'm 11 and They don't know what They're going to do after the unmentionable happens and They're Scottieless. One year ago Ginny came into our lives. We had lost our beautiful Turnberry, of 12 years, just months before. He was a perfect Scottie in so many ways and we didn't know if we could go through another loss. He left a hole in our hearts that could never be filled. But we began to research the Scottie Rescue not even knowing if we could do this. John's son and daughter had both been students in my classes but I never made the connection until we learned that they were getting a new rescue " soon". John and his family were at our door days later with Miss Ginny. She had been found on a golf course after being abandoned by her original family. Providence? I think so. Turnberry was named for the first golf course Sam had played when he went to Scotland. TB used to ride with Sam in the cart when playing a quick 9 holes. Sam was going to have to be convinced that this was the right thing to do. When Ginny came in she made a beeline right to Sam's lap and slathered him with a million kisses. There was no question that she was for us. Ginny has fit right in with our family (and the cats). She is a sweet Wheaton female and she is filling the void left by TB our black male Great Scot without feeling like she is taking his place. John knew that she would be a great fit for us and his intuition was so right. Thank you John for knowing just what we needed! Mr John Livingstone , you deserve respect and gratitude , thank you ! Thank you John and family.